They always say it’s ‘no money, no honey’… but what happens when you have to put your honey on the line for money? 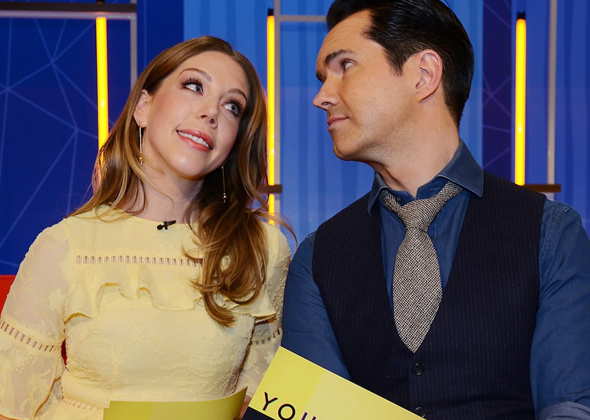 Your Face or Mine hosts, Jimmy Karr and Katherine Ryan, put couples to the test by asking them to rate each other’s looks for cold, hard cash. Comedians Jimmy Carr and Katherine Ryan put couples to the test in this entertaining gameshow that gets loving couples to rate each other's looks for cold hard cash. Over a series of revelation-filled rounds, they are forced to compare their looks with other people (including the most horrifying of all – their exes) – and ultimately with each other – in this relationship-testing game. It’s harsh, it’s cold and winter is coming… for the ones who are brave enough to try weathering the intense questioning. Now, the question is what would you choose - Love or Money?